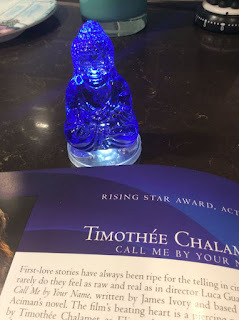 Just ten days after my Palm Springs Film Festival gala red carpet fan interaction quickie with Call Me By Your Name actor, Timothée Chalamet, I finally got his autograph and a selfie with him as he was attending the LAFCA gala to receive his Best Actor award at the Intercontinental Hotel in Century City. I have been aware of this event for over a month since this prestigious critic's group announced their winners in early December. 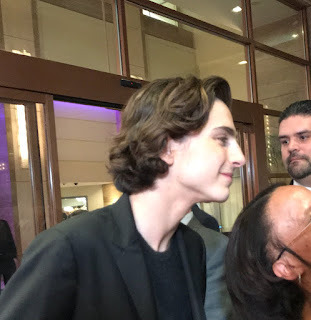 But only until this past Thursday did I get the epiphany to just go to the hotel and see if I could capture his red carpet moment. 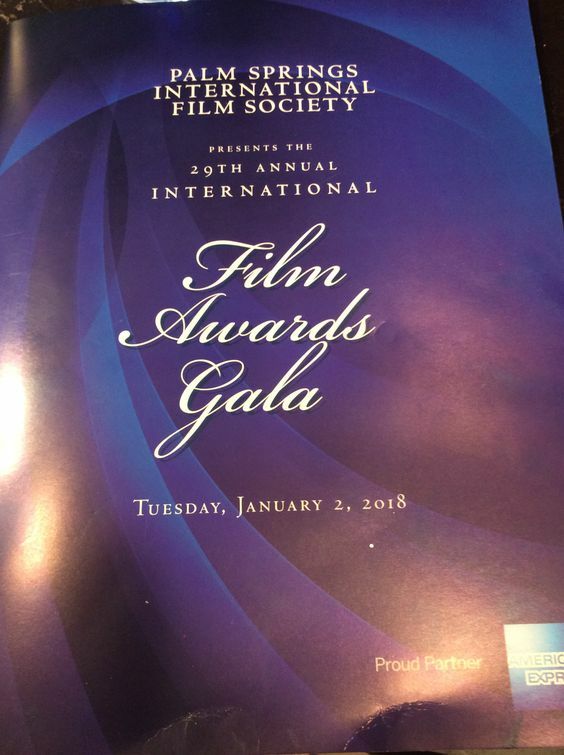 After all, LAFCA awarded CMBYN with Best Actor, Best Picture, and Best Director (tied with Del Toro), so this was a big CMBYN event. 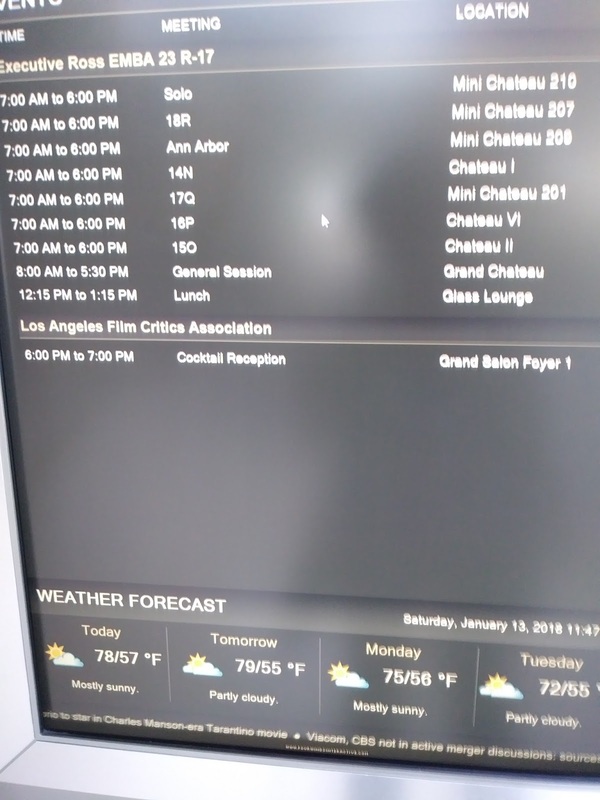 I prepared myself to leave empty handed or not being able to see anything, but the Type A planner than I am, I arrived at the hotel around 11:30 am to scope it out and see if I could gather some information about the event that will be held at the hotel. 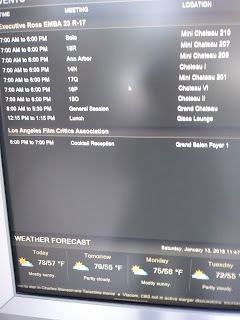 The hotel kiosk directory had the day's schedule listed and it showed that the LAFCA event was going to start at 6pm with cocktails and the gala at 7pm. Perfect! 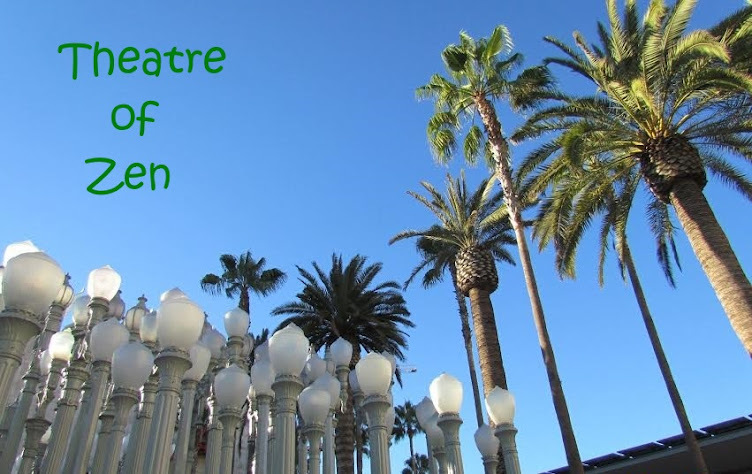 This gave me more than enough time to do some shopping at Century City Westfield mall, catch the 12:30 pm showing of The Post at AMC (which was brilliant by the way), and eat lunch before heading back to the hotel around 4pm. 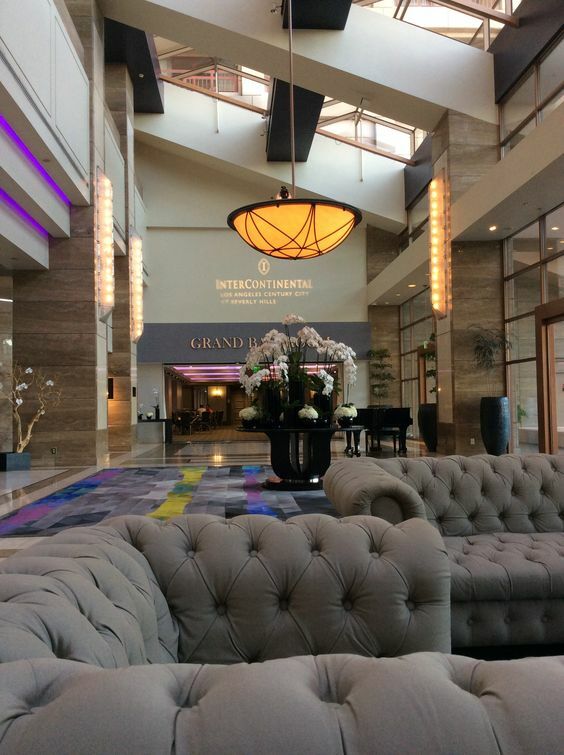 As I arrived back at the hotel, the red carpet was just being set up, so I enjoyed free hotel wi-fi and sat in the cozy lounge area of this fancy hotel for the next two hours. 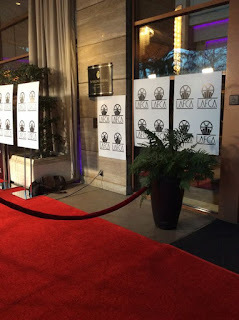 At this time, I was starting to feel positive about having a good view of the red carpet. I just sat in the lobby using the wi-fi and reading my current issue of Variety. There were no other obvious fans around, just the people setting up the event. 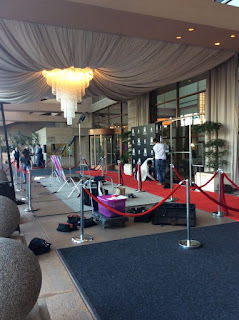 However, as time got closer to the start of the cocktail time, the first red carpet arrivals arrived promptly. The first was Michael Stuhlbarg, and then I noticed producer Peter Spears. 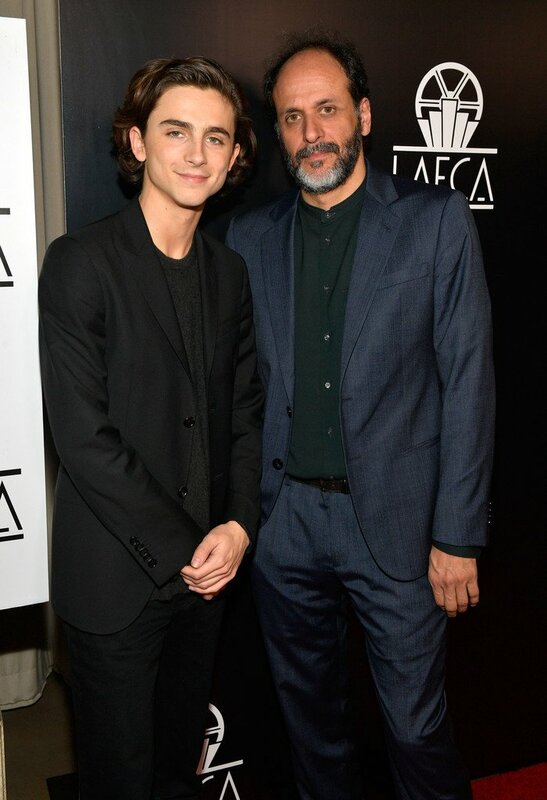 Shortly afterwards, I saw director Luca Guadagnino. They all spent a good amount of time on the red carpet talking to the press. I noticed the fan crowd was starting to swell a bit, but it was mostly hotel guests being looky loos and curious about what was going on. 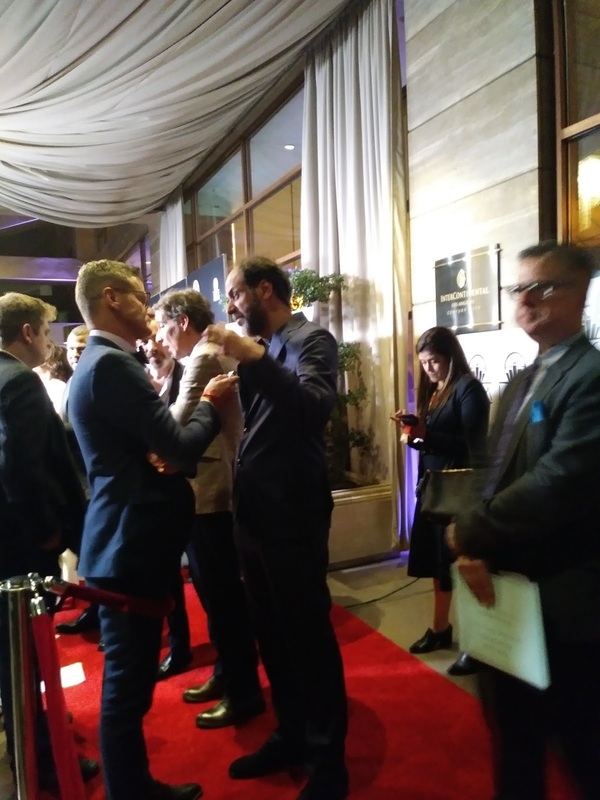 Michael went into the hotel lobby pretty quickly after he finished speaking with the press, but Luca and Peter were on the hunt for Timmy because he wasn't there yet. I over heard them saying, 'Where's Timmy it's getting late?' And so Luca went back to the front of the hotel driveway looking out for Timmy's sedan. Meanwhile, Peter was talking to a PR type person, and I gently tapped him on the arm and excused myself for interrupting, and I just told him how much I enjoyed Call Me By Your Name, and that I've seen it 3 times and that I wanted to wish him good luck with the Oscars. He said, Thank You, with a smile and did a hapchang (Buddhist like standing bow). 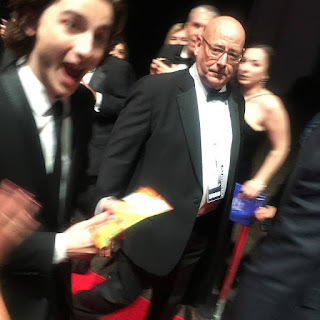 Soon after that, I kept my eye on the area that Luca was standing at and suddenly, there was Timothée coming out of a sedan, all full of smiles. Luca gave him a great big hug, and that's when Peter and Michael went over to them so they can take some red carpet photos. 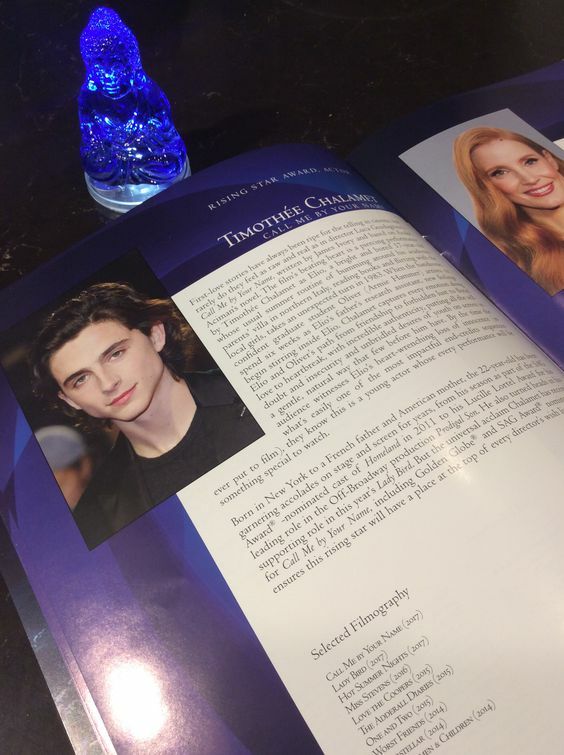 But first, the publicist wanted pictures of Timmy by himself, and the photographers went hog wild. He went up the red carpet twice to have the photographers get their pics of him. Then there was the group photos, and then Timmy briefly spoke with each reporter there. As he got closer to where I was standing, there were now at least 20 young girls. I don't know if a fairy just dropped them off, but, there they were, like on cue. Security told me that the guests weren't going to sign autographs, so that bummed me out, so I had to try to get a selfie. I've never taken a selfie with a celebrity and it's not something I want to do again, but it feels like the biggest high five when you get it. 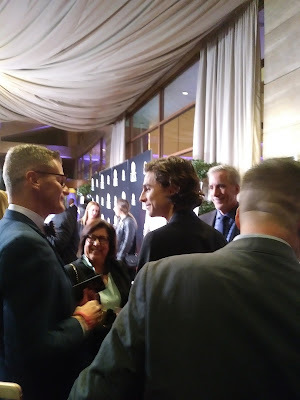 Just as the last word came out of Timmy's mouth with the last reporter at the end of the red carpet, me and another girl at the same time asked for a selfie and he said sure. So that's how I got mine. 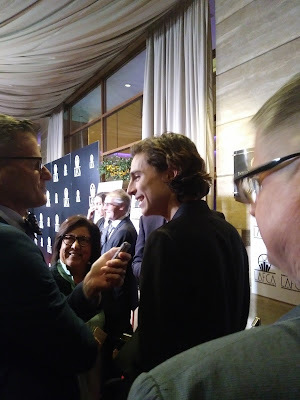 It's not the best quality but Timmy looked fine in my photo. 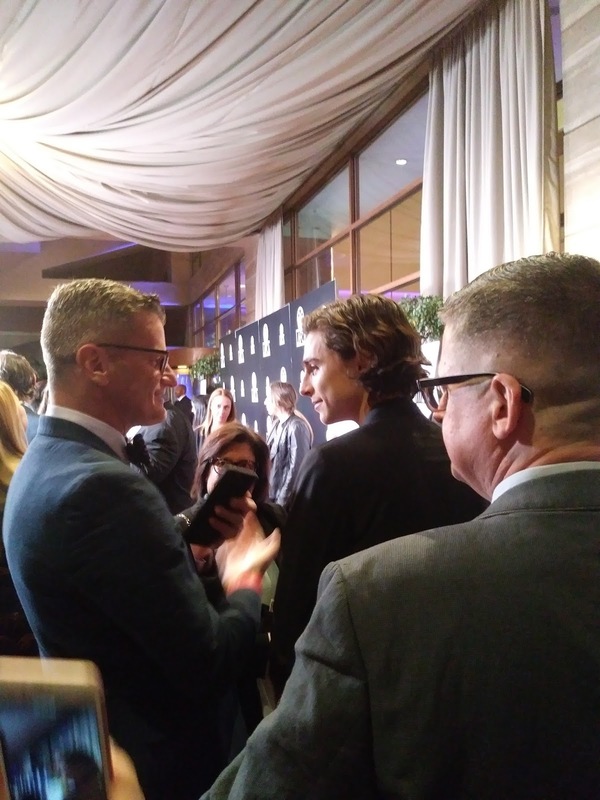 Thankfully, later this evening on Twitter, one of the journalist covering the LAFCA event posted a picture of me and Timmy taking my selfie (see below). 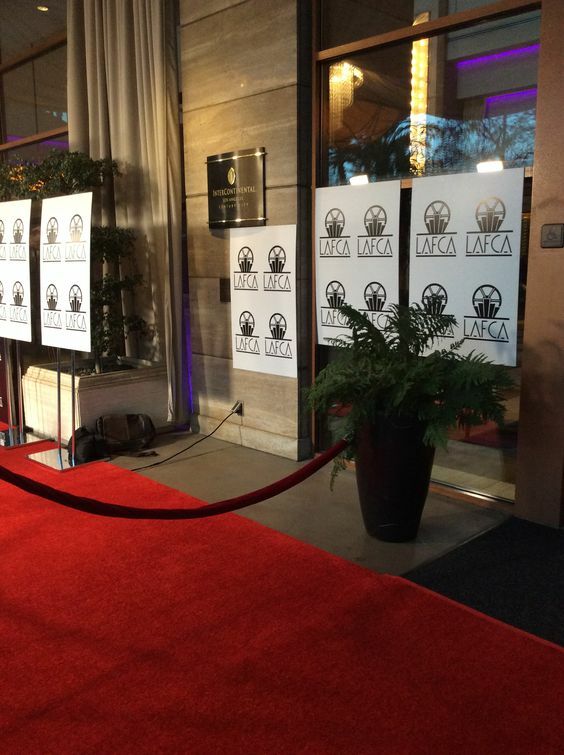 Apparently he was that last reporter at the end of the red carpet (@marcmalkin). Security and the PR people tried to steer Timmy into the hotel, but that's when the cute swarm of tweens came to him asking for pictures. They were very nice kids and Timmy being Timmy was more than happy to take pictures with them. He was recorded giving a shout out to a prolific NY stan dude that was posted on twitter, and he met a couple girls he has seen before. Just as he signed one girl's CMBYN book, I pulled out my Gay Times November 2017 magazine that had that 15 page cover article on the film. 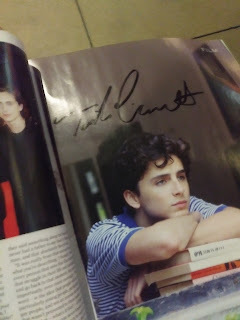 I asked Timmy to sign the magazine and he did. That's what I wanted from him. A tangible piece of memorabilia from an actor that I really adore in just these amazingly short 7 weeks. I'm totally going to frame this bad boy!! 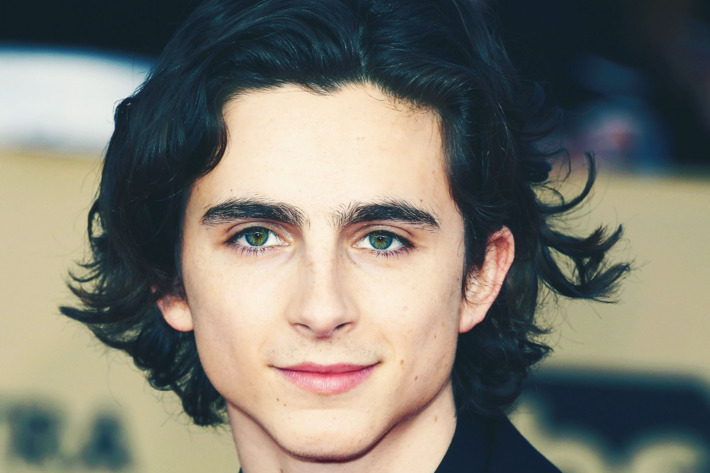 I am so happy that I followed through on this crazy spontaneous plan to just drive to the hotel and plot my logistics on how to hang out along the red carpet of this special event to celebrate Timothée Chalamet as the Best Actor of 2017 from the Los Angeles Film Critics' Association. This is a tough group of critics and for any actor to be named the best actor by them, truly is the best actor of that year. I am completely satisfied with this experience and I don't need to get another selfie with him or get another autograph. If I'm lucky to be at an event he's at, I'll happily take pictures of him again, but I don't need to wash, rinse, repeat with him. I'm good. I'm so lucky to be living in Los Angeles now, none of this would have happened in Michigan. It's so much fun being able to celebrate a worthy actor's phenomenal success with him and with my readers.